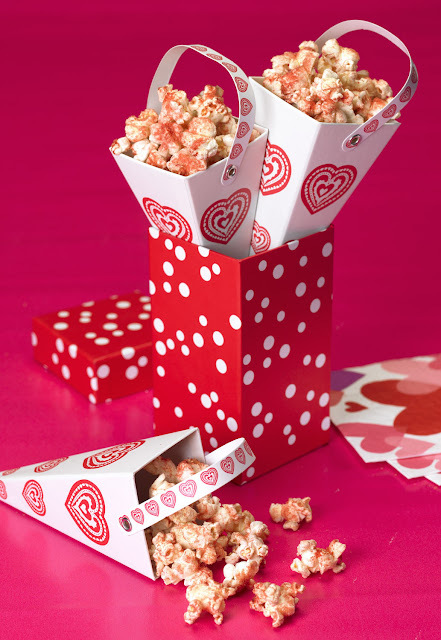 I found this delicious sounding recipe from my friends over at Popcorn.Org and thought it sounded perfect for Valentine's Day! Make this fun treat with the kids to give out to classmates! Put popcorn into a very large bowl and spray lightly with butter flavored oil. Put in 350 degree oven for five minutes. Gelatin will dissolve slightly and stick to the popcorn. I love this, looks so nice too! Thank you for sharing withe us! This is such a clever and inexpensive idea. The boxes make it super cute.